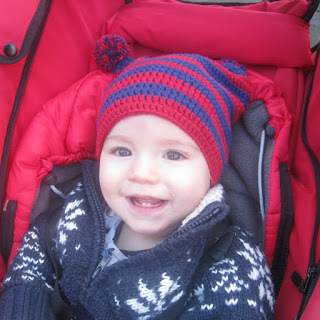 I've been sorting through the photos on the camera and found quite a few photos of things that I wanted to blog about... these two baby hats are from way back before Christmas - ooops! 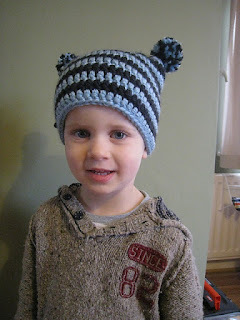 This handsome little guy is wearing a variation of the stripped hat I made up for Sam 3 years ago. The hat is so simple to make - it is straight across the top and then worked in rounds in a square shape. For each row you carry the yarn across so no need to rejoin yarn and barely any finishing up at the end. Once you have the size you want then just add two pom poms to each corner and you're done! I also made another of these stripped baby hats for my little niece and though I really like the colours I much prefer the bold boy hats.